EcoLogic has completed over 40 freshwater mussel investigations associated with bridge construction and rehabilitation, streambank stabilization, flood protection projects, reservoir releases, pipeline crossings, and waterfront development projects. 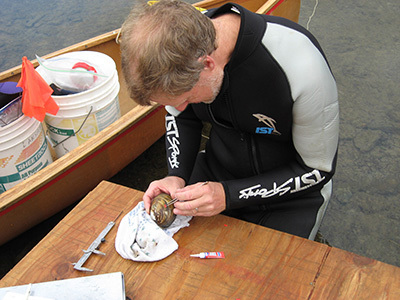 Led by Kurt Jirka, a recognized authority on native freshwater mussels in New York State, our staff has conducted surveys for native freshwater mussels in the Susquehanna River Basin (18 sites), Allegheny River Basin (15 sites), Genesee River Basin (5 sites), Delaware River Basin (3 sites), and Neversink River Basin (2 sites). Many of these surveys were focused on determining the presence/absence of state- and federally-listed threatened and endangered species, documenting habitat conditions that supported these species, and identifying strategies to protect mussel populations of from project-specific impacts. Some projects also included transplanting threatened or endangered mussel species from project impact zones to appropriate habitat outside of impact zones. These efforts included follow-up monitoring of transplanted mussels to determine short-term and long-term survival. Each mussel survey we conduct is designed to meet the specific needs of the client based on the project objectives, physical characteristics of the site, and requirements of the regulatory agencies. Specific services include qualitative and quantitative mussel community surveys, habitat evaluation, relocation and monitoring of freshwater mussels, obtaining required permits and collection licenses for mussel survey work, preparation of survey reports and reports required by licensing agencies, and consultation with regulatory agencies regarding potential mitigating measures. Our reports typically include a description of survey methods used, list of mussel species present at the site, a map of mussel species distribution, general description of habitats surveyed, a discussion of the potential impacts of the project to mussel populations at the site, and potential mitigating measures to minimize or avoid such impacts. One potential mitigation measure is to relocate threatened or endangered species to appropriate habitat outside of the project’s impact zone. EcoLogic is experienced in conducting mussel relocations and providing follow-up monitoring to evaluate the survival of relocated mussels, and the success of the relocation effort. Clients for whom we have conducted freshwater mussel investigations include the New York State Department of Transportation, the New York State Department of Environmental Conservation, several engineering firms, municipalities, a nongovernmental organization, and a private landowner. Consultation with regulatory agencies regarding potential mitigation measures.